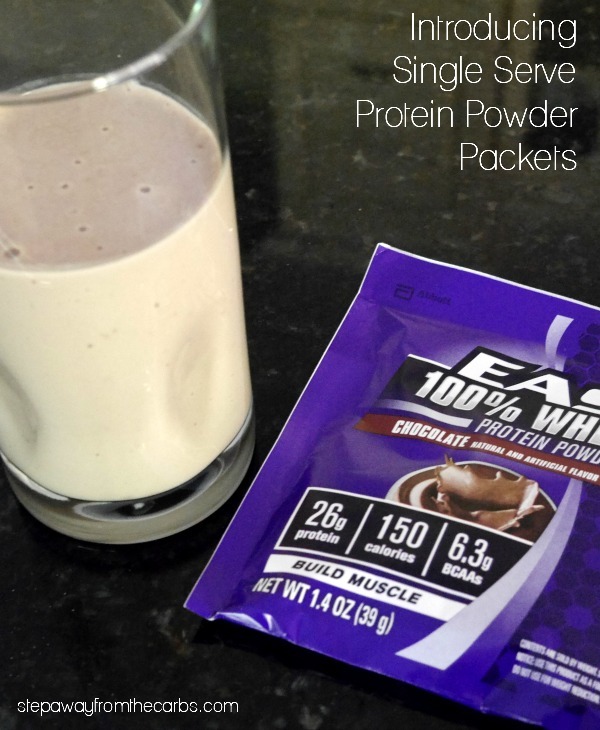 If you use whey protein then you’ll love these convenient single serve protein powder packets! Do you use whey protein powder? 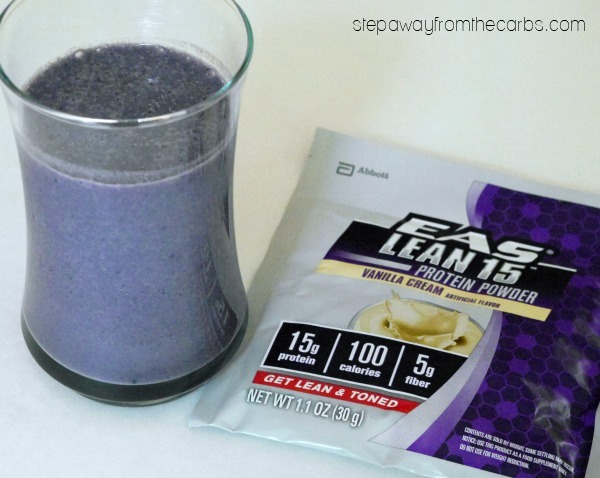 My husband sometimes gets some in and I have used it to make things like a blueberry protein smoothie. But it usually comes in big huge containers that are pretty expensive for such occasional use. When I found out that EAS® were now making single serving packets, I went on down to my local Target and picked up a box of EAS® 100% Whey Single Serving Packets (chocolate) and EAS® Lean 15 Single Serve Packets (vanilla) from their Pharmacy department (you can see how popular this brand is!). EAS® Protein Powder packets are the ideal solution if you don’t want to commit to a huge container AND it saves all the measuring and scooping as they are super convenient. They measure the same as one scoop from one of the big tubs. I tried out the chocolate Protein Powder first. 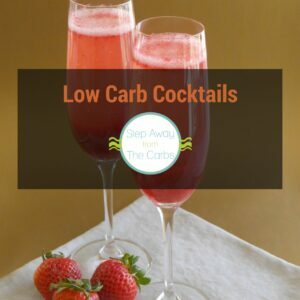 It contains 6g net carbs per serving which sounds great to me! I simply ripped open the packet, tipped it into a glass, added some almond milk, blitzed it with a stick blender and it was good to go! 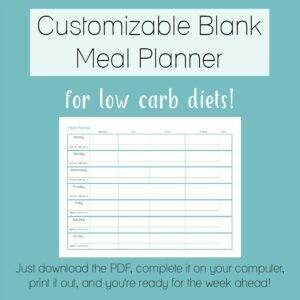 Creamy, delicious, filling and not TOO sweet. And so easy! 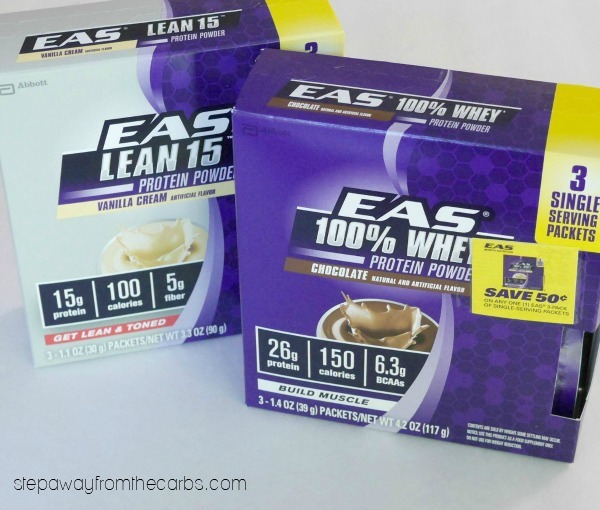 Next I tried the EAS® Lean 15 Single Serve Packet in vanilla cream flavor. These packets contain 15g protein, 100 calories, 5g fiber and 6g net carbs! Just mixing it with almond milk tasted delicious, but I decided to throw in a handful of fresh blackberries before I blended it – and got this wonderful purple protein drink! As a busy mom I *love* how convenient these packets are. If I haven’t had time for breakfast before the school run it takes less than a minute to whip up one of these filling shakes and I can take it with me. 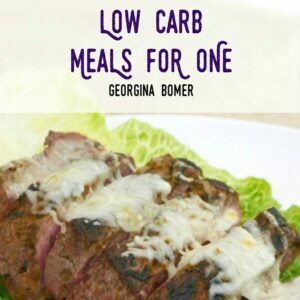 It can be tempting to grab something high in carbohydrates because often it is more convenient – but these new protein powder packets mean that I don’t have to mess up my diet.